As published by the U.S. Patent and Trademark Office, Apple's U.S. Patent No. 9,497,534 for "Sports monitoring system for headphones, earbuds and/or headsets" is nearly identical to a patent grant of the same name issued in 2014. Today's version claims priority over the older document (which itself claimed priority over a provisional application dating back to 2007) and adds a few details suggesting Apple might finally integrate some of the described technology into a near future product, specifically a next-generation AirPods device. According to recent revisions of the present patent, Apple's fitness monitoring system integrates an advanced biometric sensor package capable of detecting various physiological metrics including temperature, heart rate and perspiration levels, among others. Like most wearables designed with integrated sensors —Apple Watch among them —the proposed earbud-style device would track biometric data through skin contact within the ear, as well as motion activity via onboard accelerometers. 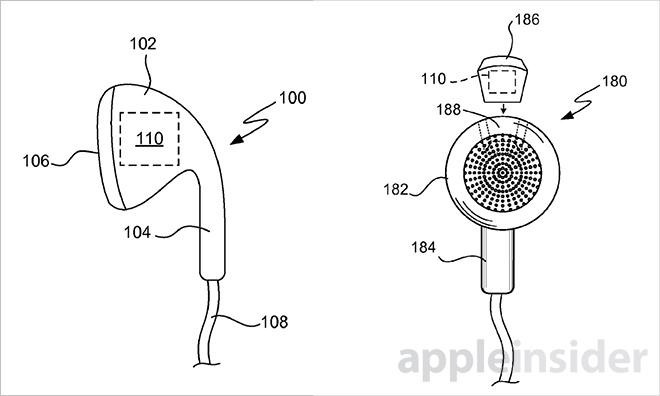 The revised document, however, contains an updated set of claims suggesting Apple is working on an advanced iteration of the patented technology that could make its way into a set of AirPods. Of note, the new patent iteration puts an emphasis on a touch- and voice-based input interface which replaces mention of "head gestures" seen in the older version. It should be noted that references to head gestures do appear in the patent summary, but are no longer present in the important claims section. With the updated invention, users interact directly with touch sensitive portions of the headphone device to trigger system controls like changing music tracks or invoking Siri. Alternatively, users can speak commands into a provided microphone, which are then processed onboard or offloaded to a host device like an iPhone. 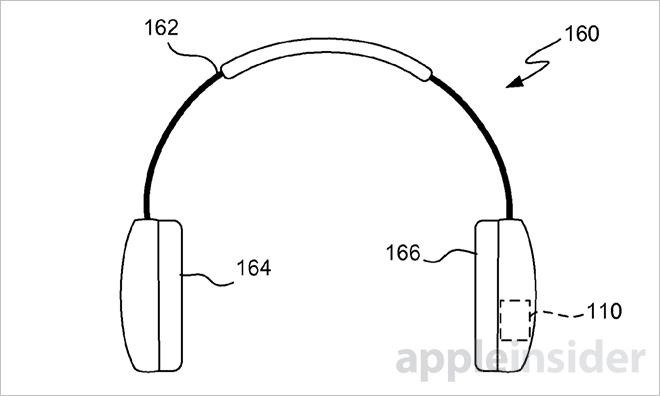 The described headphone platform sounds akin to Apple's new AirPods wireless headphones introduced in September. Along with the usual speaker and microphone setup common to most in-ear smartphone headsets, AirPods features embedded infrared and motion sensors for controlling various system functions. For example, AirPods can power on and off independently when the infrared sensors detect the device is removed from a user's ear. Onboard accelerometers enable tap controls to activate Siri, which is subsequently used to control playback controls, volume settings and other software features. 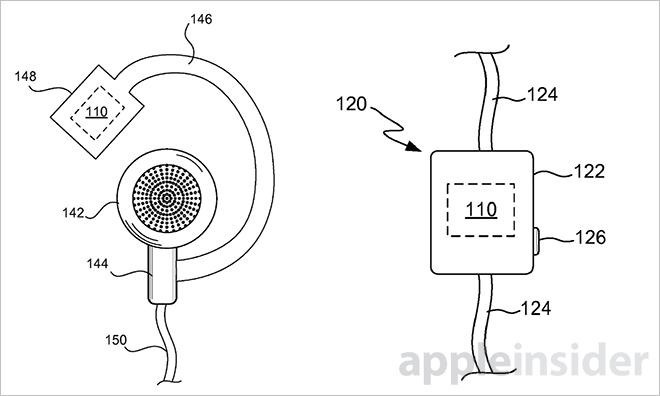 It is unclear whether Apple intends to integrate sports and health monitoring functions into its AirPods wireless headphones, though incorporating a more advanced sensor stack in the earbud product might be a technical, but difficult to implement, possibility. With AirPods already hitting production snags, however, the advanced technology is unlikely to arrive anytime soon. Apple's sports and health monitoring headphone patent was first applied for in March 2015 and credits Christopher Prest and Quin C. Hoellwarth as its inventors.